Seeking to take a giant step to the forefront of aquatic sports in the United States, the city of Mesa, Ariz., has commissioned the design and construction of a monumental indoor swim center to be built in observance of the strictest international competitive standards. Here’s a look at what’s been involved in realizing the city’s ambition, as seen from the perspective of the pool architecture and engineering firm that was asked to join the design team. When it’s completed sometime in mid-2002, the Mesa Indoor Aquatic Center will be among the premier U.S. facilities for competitive swimming, diving, water polo, synchronized swimming and synchronized diving. 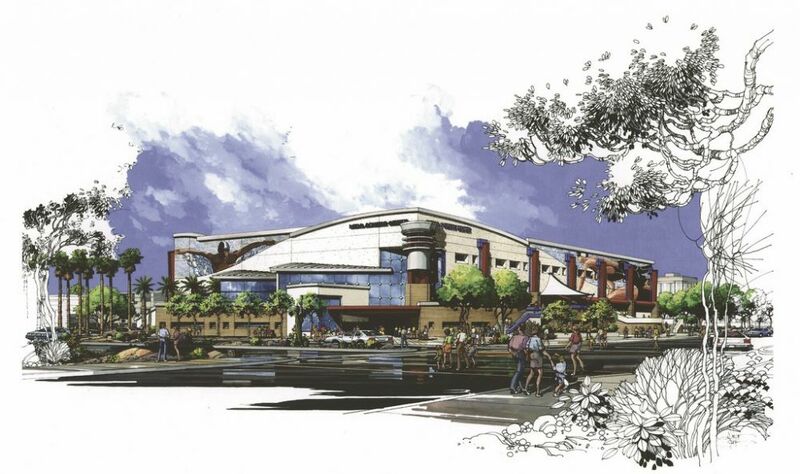 Once it’s up and running, MIAC will be the country’s largest indoor competitive swimming facility owned and operated by a municipality; just as certainly, it will also act for years to come as host to countless world-class aquatic competitions. A project like this is a dream come true for a firm like Rowley International of Palos Verdes, Calif., which is dedicated to designing and engineering competition pools at the highest level. Who could ask for more than clients who have proved over and over again their willingness to do what it takes to achieve their lofty goals? More important, we were brought in right at the outset and so have been fully able to approach the project from the technical/engineering standpoint as well as from the end user’s perspective. From Day One, we’ve worked hand in hand with the city and the project’s architect to establish a design that meets the needs of the widest possible range of aquatics programs. Best of all, the citizens of Mesa, Ariz. – including everyone we’ve met with any involvement at all in the project – have made it perfectly clear that they were after a facility that did not compromise in any way. As we’ll relate in this article (the first of three on this project), they wanted competition to be the priority, and “world class” was the highest objective in every detail. The basic concept of building two indoor competition pools under one roof may not sound all that unique or trailblazing, but it is once you recognize that almost every other existing facility in this country has imposed limitations on that ideal in one way or another. In almost all top-flight NCAA facilities, for example, you find pools that have been made to accommodate first of all the needs of their institutions; for the most part, their designs have not been considered or executed with international competition uppermost in mind. In fact, when called on to host World Cup competitions or other international events, many U.S. facilities must apply for waivers from certain requirements of FINA, the body governing international competitions. Yes, there are wonderful aquatic facilities in this country, but none that we know of have sprung solely from the desire of any organization to build to the highest available competitive standards. 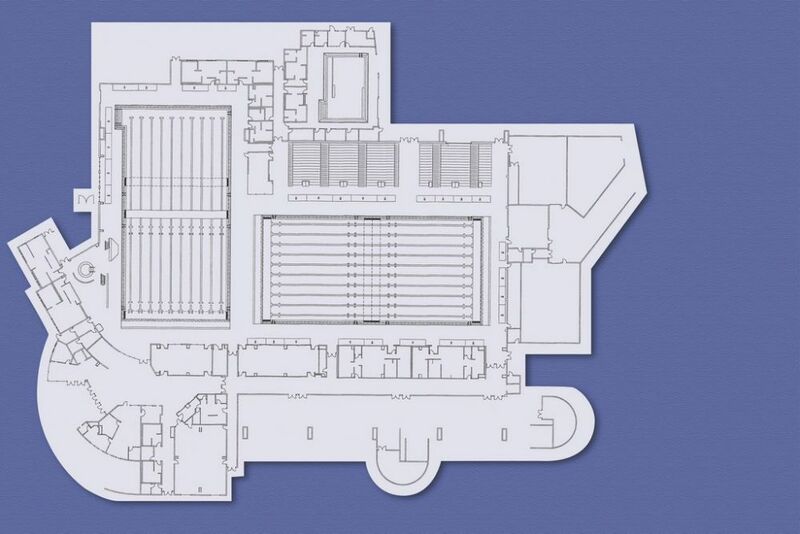 The layout of the pools for the Mesa Indoor Aquatic Center is designed to maximize their utility in the conducting of championship events at the international competitive level – an ambition that has driven every phase of the design process from the outset. Although the layout seen here is subject to adjustment as the project moves toward the construction phase in the next few months, the “No Compromises” motto will always be observed. Mesa has just that ambition and, as it turns out, the wherewithal to make it happen. And there was nothing narrow in the vision: We were called on to deliver world-class designs for competition in swimming and diving as well as water polo, synchronized swimming and synchronized diving. The upshot of our discussions and deliberations is a facility with two pools, side by side. One pool is 54 meters long by 25 meters wide with a uniform 3-meter depth throughout. Our experience at Rowley International in designing racing pools (including the pools at the University of Southern California that hosted swimming events during the XXIII Olympic Games in Los Angeles in 1984) has taught us that deep water is one key to a fast pool. This pool also features two stainless steel bulkheads that will afford our clients maximum flexibility in aquatics programming. This pool is set in the facility’s prime viewing area and will accommodate international competitions in swimming, water polo and synchronized swimming. There is a second 52-meter by 25-meter pool, known informally as the “variable-depth pool,” which is designed to accommodate international competitions in swimming, water polo, synchronized swimming and diving. This vessel also offers the availability of a large shallow area that will accommodate a range of community aquatics-education programs. The facility is truly an aquatic-sports wonderland: two full-sized pools that can accommodate five major aquatic sports under one roof, two 50-meter pools for swimming, two FINA-compliant 20-by-30-meter water polo pools. For water polo and synchronized swimming, it is the first facility ever to offer competitive space, side by side, where simultaneous matches can take place. The diving array is just as impressive: A state-of-the-art 10-meter tower will feature intermediate training platforms at 7.5, 5- and 1-meter heights. A competition 3-meter platform and three 3-meter springboards, perfect for synchronized diving, are here along with two 1-meter springboards for training and recreation. At its deepest, the variable-depth pool is 5.5 meters deep. Both pools can be viewed from the spectator area, which will have permanent seating for 2,800 and enough deck seating and removable seating to accommodate a total of 4,000 spectators. The seating can be configured in a variety of ways to accommodate different types of competitions and events in different locations throughout the 144,000-square-foot facility. And because the owner is a municipality, MIAC isn’t linked to any particular athletic body and so becomes immediately available to the full range of aquatic-sports organizations, both in the United States and on an international basis. That’s very special and is part and parcel of the project. The mandate from the city was very clear: There are to be no obstacles to conducting any sort of internationally sanctioned meet for any given aquatic sport. At the same time, the facility is also at the disposal of the citizens of Mesa. To that end, the design was established to provide for flexibility of programming, from a therapy pool to a large area in the variable-depth pool dedicated to accommodating learn-to-swim programs, aquatic exercise classes and all the kinds of activities associated with municipal pools. The project architect is BLPW of Albuquerque, N.M. In September 1998, they called us in to make a presentation on the simple concept of two 50-meter pools to accommodate international competitions. We made a personal presentation that not only established our credentials, but also offered an overview of how we would approach developing the design. Soon after that first meeting, BLPW selected us as aquatic consultant – and made us part of the team. The City of Mesa is no newcomer to aquatics. It already has 13 other community pools considered among the finest in the country. The National Recreation & Parks Association has recognized its aquatics programs, and its peers nationwide have cited the city for its commitment to community recreation in general and aquatic sports in particular. In other words, it’s no huge surprise that this would be a city that would make such a high level of a commitment to aquatic sports. We at Rowley International (Palos Verdes, Calif.) have a wonderful working relationship with BLPW of Albuquerque, N.M., which was retained as the architect for the Mesa Indoor Aquatic Center and brought us in on the project right at the start. At $21-million plus, this project isn’t exactly huge for a firm of their capability. But the value of this sort of facility cannot be measured in dollars alone, and it is clear that they’ve come to recognize and appreciate the significance of the project to the nation’s aquatics community as well as to the city of Mesa, Ariz. DESTINED TO BE A LANDMARK: With huge murals on all four faces of the building, the Mesa Indoor Aquatic Center will become a prominent fixture on the Mesa scene for years to come. In fact, they now see as we do that this venue has the potential to reinvent the aquatic-sports movement in the United States. Answering the call, they’ve come up with a remarkable building – a strikingly modern architectural form that includes beautiful geometry, shapes and forms throughout. 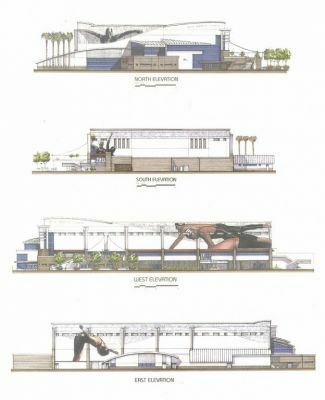 The facility doubtless will become a landmark in downtown Mesa – particularly when the huge, painted murals depicting aquatic sports are applied to the sides of the building. From the start, the MIAC concept has attracted a tremendous amount of attention in the global aquatics community and has tied us as designers into a fantastic network of individuals and organizations all wanting input into the creation of this grand facility. We took our time up front and have processed all the available information and feedback. Once we moved beyond the generalities and the entire design team had been assembled (including structural and electrical engineers as well as aquatics experts), we moved into what is known as the programming phase, which lasted for a total of 15 months. During this time, we created an elaborate matrix to track specific sorts of aquatic programming as defined by the needs of user groups. This covered dimensions, depths, access, bulkhead distribution and every conceivable variable that went into creation of world-class facilities in each of the targeted aquatic sports. It’s not something one often considers, but there are distinctions between the requirements and regulations for competitive facilities when it comes to activities as diverse as swimming, diving, water polo, synchronized swimming, synchronized diving and instructional, recreational and therapeutic aquatics. We took each set of specific needs and dimensional requirements and went through a detailed (almost microscopic) analysis of the facility, creating specific programming layouts, bulkhead positions, lane configurations, overall physical configurations, racing courses and competition layouts for each proposed use in turn. When you add in accommodations for kayaking and canoeing as well as scuba lessons, learn-to-swim programs, Red Cross certifications and physical therapy, a picture emerges of a delicate set of balances that had to be dealt with in making the facility meet the clients’ ambitions. In a typical project’s programming process, working with clients is all about telling them what they can and cannot do based on the facility being designed. When budget is an issue, for example, many clients will start compromising and remove items, such as a bulkhead or two, or reduce the size of a pool, or trim the number of diving boards and platforms. In the usual process, we tell them next how those decisions influence the actual functionality of the facility and how its usefulness will be limited. On this project, however, the programming we did was always inclusive, always driven by the needs of the sports. In the case of diving programming, for example, we sent the preliminary package to U.S. Diving and worked with executive director Todd Smith and technical director Ron O’Brien (Greg Louganis’ coach), who reviewed it and came back to us with a variety of specific recommendations. We also worked with Jay Flood, who was commissioner of aquatic sports for the ’84 games and has been involved in FINA ever since. We took those comments and recommendations back to the city of Mesa and started racking and stacking all the various programs and the attendant facility requirements. From there, we started putting a dollar value on the whole package. In this case, however, the city took nothing out. They declared categorically that they wanted to meet full international competitive standards for all applicable sports and whatever other standards could be applied to other activities. The original budget was $11 million – not nearly enough to fulfill this vision without severe compromises. In fact, our estimates had the no-compromise project coming in at about $18 million, and that’s what we reported. At that point, the city went to work. After months of fundraising and re-budgeting, project backers prevailed and covered a total budget of more than $24 million, including some amenities that went beyond the scope of our proposals. We’re still in the design and engineering phase, but we’re reasonably confident this budget will work. The current plan covers it all: the electronic scoreboard, deck areas, the lobby area, the queuing area for spectators, locker rooms – the works. It also covers the needs to treat all dimensions in metric terms to meet international standards, including lane widths and elevations on the ends of the pools for the timing touch pads as well as the starting blocks. With the overall programming and budgeting in place, we’ve now begun the process of fine-tuning the design and engineering of the pool systems. This phase will take a while as we prepare detailed plans and specifications that will be used to obtain bids from contractors. [ ] The main racing pool will hold 1.1 million gallons of water, while the variable-depth pool will hold 1.2 million gallons. Once you add in a small therapy pool and a hot-water pool, the overall facility is pushing 2.5 million gallons in all and will need 4.1 million Btus to keep it all heated. The plumbing runs will feature pipes from 2 to 16 inches in diameter flowing through big, automatic hi-rate sand filters. With any indoor environment for aquatics come two immense challenges: noise and air quality. Noise drives more people away from standard indoor pool environments than any other factor, and it’s our observation that those with the least tolerance are older folks, such as grandparents who are taking grandkids to swimming lessons. To address this issue, we’re working closely with the architect’s consulting acoustical engineer to design interior features for sound absorption – a double challenge when you consider than most sound absorbers are moisture absorbers as well. Obviously, this relates to the second challenge to indoor facilities and the fact that everything in an indoor aquatic environment must stand up to moisture. Design of air-handling systems and dehumidification regimes is therefore of critical importance. But it’s a bit of a Catch 22: Glass and stainless steel and tile are basically impervious to the effects of moisture, but they are also acoustically bright and actually intensify sound and noise. Finding the right balance between the needs for noise control and moisture resistance is now in the hands of the engineers – and we’ll look at the solutions they develop in our next article. [ ] We’ll be using deep gutters with deck-level overflow down the sides of the pools and cantilevered gutter system at the ends. (We took this approach so that the ends of the pools could be raised high enough to meet FINA standards.) In the variable-depth pool, the deck-level flow is carried around the full perimeter of the shallow end to allow for easier access for recreational swimmers and kids. [ ] At this point, there’s no money in the budget to allow for tiling the surface of the deck, which would be beautiful. We’re now evaluating a variety of possibilities, including brushed or stamped-concrete treatments of some kind – but we still have hopes that the final budget will have enough room to permit the use of tile. [ ] We’ll be using gas chlorine to sanitize these large bodies of water. We prefer this approach: Used well in a well-engineered system, gas chlorine is an effective, affordable way to sanitize an indoor pool. The project is set to go out for construction bids this summer. As the design consultant, Rowley International will be involved throughout the bidding and selection process and during the entire construction process. On projects of this size, we know we can count on the unexpected – and there are sure to be challenges along the way. Given the commitment of the citizens of Mesa and the passion and overall skills of the entire design team, however, there is little doubt in our minds that Mesa Indoor Aquatic Center will achieve its high-flying goal of becoming the country’s premier site for swimmers, divers and aquatic athletes of all stripes come to test themselves against the best the world has to offer. We’ll return to Mesa in 2002 for a look at the project as it is being constructed. At that time, we’ll cover technical features of the facility in greater detail, then follow up later with a final report on the project’s completion and dedication. William N. Rowley, PhD, is founder of Rowley International, an aquatic consulting, design and engineering firm based in Palos Verdes Estates, Calif. Dr. Rowley is one of world’s the leading designers of large commercial and competition pools. His most notable projects include partial designs for the competition pools used in the Olympic Games in Munich (1968) and Montreal (1972), and he acted as aquatic consultant for the design of the Olympic Pool Complex in Los Angeles (1984). His projects also have included a wide range of non-competition pools, including the White House pool in Washington, the Navy Basic Underwater Demolition Training Tank in Coronado, Calif., and the resort pool at the Hyatt Regency at Kaanapali Beach on Maui. Dr. Rowley is involved in a range of local, state and federal entities consulting on construction and safety code requirements. Patricia Soto is project designer and manager with Rowley International. She has an extensive background in competition swimming, aquatic programming and architecture and has been involved in competitive swimming and coaching throughout her life. She has traveled extensively throughout North America, applying both her architectural background and knowledge of aquatic sports in the development and programming of aquatic sports facilities.